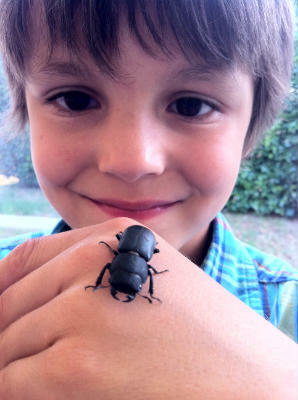 Hello my name is Joshua and welcome to my website about Stag Beetles. They are very rare and you must not hurt them. REPORT A SIGHTING: If you have seen a stag beetle (or stag beetle larve, pupa or eggs) please use the form here so we can map the population. Left: Is a picture of me with a lesser stag. You can tell the difference as it’s matt black all over and square-ish rather than shiny conker coloured and more oval. With lesser stags the males and females look the same, unlike the greater stags which have the noticeably different ‘antlers’. 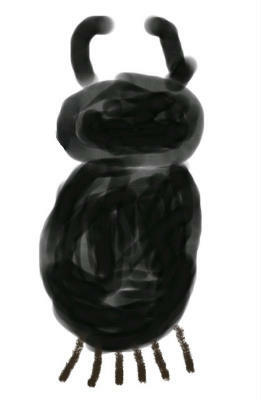 Below is my drawing of a stag beetle. There are photos on the other pages. If you have drawn pictures of stag beetles or taken photos please send them in for inclusion on the site. If your class does a project on stag beetles please let us know how you get on. We'd welcome any information or photos etc.